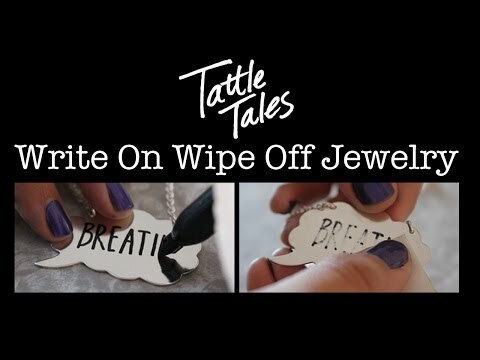 Write On/Wipe Off Tattle Tales by Punky Jane...get ready to make your fashion statement! Our exclusive write on/wipe off design let’s you share your mood, feelings, favorite quotes and lyrics, or a stern warning to everyone around you when you’re having one of those days. Even leave it blank...people will wonder what you’re up to. Everything you need is included...simply uncap your pen and write/doodle to your heart’s content. When you’re ready for a change, use one of the white polishing pads to remove your message and start again. And there’s plenty of room to share your statement...your Speech Bubble Tattle Tale is made from solid 22 gauge, sterling silver and measures 1-1/2” wide by 7/8” tall, not including the tail. Your handcrafted piece arrives in a sweet purple gift box along with a kit containing everything you need.